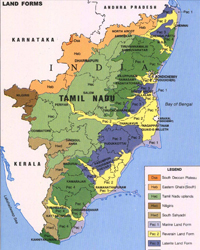 With a land area of 1,30,058 sq km and a long coastline along the Bay of Bengal in the east, the towering Western Ghats forming a natural border to the west separating the state from Kerala, the states of Karnataka and Andhra Pradesh sitting on its top in the northwest and north respectively, the Dravidian home is known for tropical climate with rice being its chief cultivation. Over the centuries, Tamils have excelled in all forms of trade and business, industry and maritime commerce. But the fertile land has never let them down as they lived as a self-sustained community over the millennia dating back to Sangam period (400 B.C. to 300 A.D.). Broadly the state of TN has two main geographical types - lush, green and fertile plains in the east and Western and Eastern Ghats to the west-northwest consisting of lofty mountains. The Cauvery river irrigates most of the plains where agriculture and related activities still offer livelihood to thousands of people. Farther down south, the flatlands of Madurai and Ramanathapuram districts suffer from water scarcity and depend on monsoon for relief. Apart from Cauvery, other rivers like Ponnaiyar, Tamarabarani, Palar and Vaigai flow eastward from the hill ranges. Hill districts Nilgiris and Kodaikanal originate mostly from the Western Ghats, while lower peaks (Javadi, Kalrayan and Shevaroy) that are offshoots of the Eastern Ghats are at the central zone of the state. 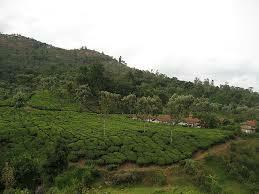 Some of the peaks at Nilgiris, Anaimalai and Palani hills exceed 8,000 feet in height. More specifically, the Anai Peak (8,842 feet) in the Anaimalai hills is the highest mountain in the peninsular India. Heavily dependent on monsoon rains, the agriculture is worst hit whenever there is shortage of precipitation. Moreover, the state used to suffer from periodical bouts of drought and the government used to take emergency measures to tide over the exigencies. Mainly tropical in nature, the climate varies from dry sub-humid to semi-arid. Both southwest monsoon (June to September) and northeast monsoon (October- December) with dominant wind pattern bring in copious rain to the state. While the period from January to May is dry and humid. The average rainfall for TN is 945 mm, of which 48% comes from NE monsoon and 32% is through SW monsoon. If the rains fail to recharge the groundwater, reservoirs and lakes, then the state has no alternative but to rely on water supply (or river flow) from neighbouring Kerala, Andhra Pradesh and Karnataka.